All my current posts can be found at Acrovision. Zero more days to be a teacher. Made it. Whew. Thought this would be a good way to close this out. Joe, my third grade classroom mascot, said it best for me, at the end of my 31 year teaching career. He was the last to share at Show and Tell on the last day of school. He got a big round of applause. Three days left being a teacher. 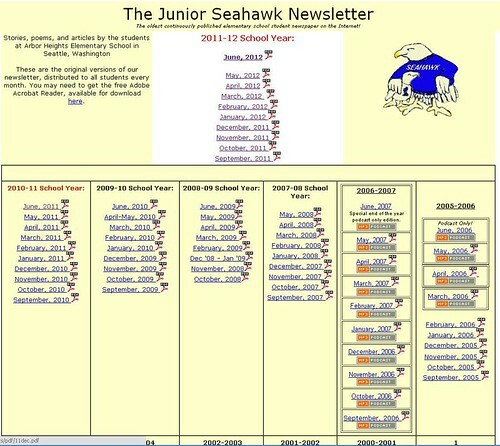 After an incredibly intense day in the classroom, giving away just about everything but the kitchen sink to my kids, I settled in at the computer at home to work on the Jr. Seahawk Newsletter for the last time. It's the student newsletter, something I inherited in my third year of teaching at Arbor Heights - which means I've done it for 18 years. It was started by another teacher, Gretchen Thompson, my first year there, so this year has been Volume 21. I have billed it for many years as "The oldest continuously published elementary school student newspaper on the Internet!" Nobody has ever questioned that, because it's true. It first appeared online, on the school's website, in 1994. Just for kicks and giggles I decided to count all the editions. 144. At an average of 4 hours production time per issue, that works out to 576 hours. Roughly 16 school weeks. Count the several from 2002 and 2004 I have on my computer, never got uploaded (but will this summer), and we're looking at 18 school weeks, easily. Half a year's worth of work, sitting at my computer, getting student writing edited and online. Tomorrow I have to get there extra early to run off 400 copies. For the last time. Four days left to be a teacher. So many things to write about, and so very little time. I guess what struck me and stuck with me was connecting with my colleagues today. Not the people I work with every day, but my virtual colleagues. 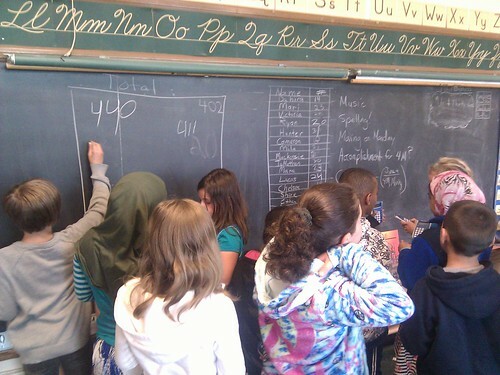 I let the news drop in the Classblogmeister list that I was retiring, as I was letting David Warlick know about a sluggish response on my classroom blog. Several very nice responses followed, wishing me well, and thanking me for this or that over the years. From really, really fantastic teachers whom I admire greatly. So it meant a lot. But it struck me that the people I work with every day really have no idea what I do online, what I have accomplished, have influenced, or have created with technology over the years. Goodness knows, I have tried. It is like I have this secret life that nobody I work with knows about. Six days left to be a teacher, and I'm wavering. Not on retiring, no way. But I AM reconsidering the decision I made in my third grade class and blogged about in 7: that they don't get to blog over the summer, as all my other classes have been able to do. The issue, I told them, is that I won't be an employee of the public school system anymore. Why am I struggling with this? Well, there's fairness of course. Then I finished approving their short reflective blog posts about the end of their blog. Their writing got to me. Much of it was about my retirement. And I think I have a way for parent permission to work. So, here it is - one more writing assignment for the year, and it HAS to be completed in school on Monday. They will need to compose and post persuasive writing pieces about why they should be able to keep on blogging over the summer. And um, more than just: it isn't fair! I've assigned more writing pieces for this year's bloggers (24) than in any of the previous six years. I have a feeling their motivation will be right up there. We'll see how they do. Well, we are finally nearing the end of the school year out here in Seattle. The last day of school is June 22nd. The students at roomtwelve.com know their blogging will end here, too. But it will be different this time, because I am retiring from teaching at the end of the school year. In the past, students have been able to blog from home over the summer, or even continue from another classroom, with parent permission. But because I will no longer be an employee of the school district, I must close down the blog. But wait! It's not going away!! It will stay right here, with the thousands of articles written by the third graders in Room twelve. There just won't be any new writing going up. One thing I will keep active over the summer though, is commenting. Visitors can leave comments on any student or teacher writing until September 1, 2012. Many, many thanks to Mr. David Warlick, who designed and maintains classblogmeister for thousands of bloggers! Teachers and students are grateful and forever in your debt, David!